(Nanowerk News) Scientists from the Universities of Cambridge and Bristol have found a way to create plastic semiconductor nanostructures that absorb light and transport its energy 20 times further than has been previously observed, paving the way for more flexible and more efficient solar cells and photodetectors. The researchers, whose work appears in the journal Science ("Long-range exciton transport in conjugated polymer nanofibers prepared by seeded growth"), say their findings could be a “game changer” by allowing the energy from sunlight absorbed in these materials to be captured and used more efficiently. Lightweight semiconducting plastics are now widely used in mass market electronic displays such as those found in phones, tablets and flat-screen televisions. However, using these materials to convert sunlight into electricity to make solar cells is far more complex. 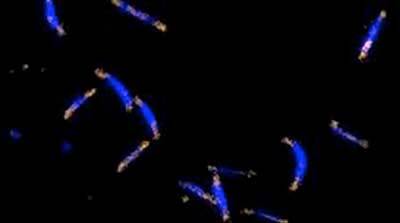 The photo-excited states – when photons of light are absorbed by the semiconducting material – need to move so that they can be “harvested” before they lose their energy. These excitations typically only travel about 10 nanometres in plastic (or polymeric) semiconductors, so researchers need to build tiny structures patterned at the nanoscale to maximise the “harvest”. Dr Xu-Hui Jin and colleagues at the University of Bristol developed a new way to make highly ordered crystalline semiconducting structures using polymers. Dr Michael Price of Cambridge's Cavendish Laboratory measured the distance that the photo-exited states travelled, which reached distances of 200 nanometres – 20 times further than was previously possible. 200 nanometres is especially significant because it is greater than the thickness of material needed to completely absorb ambient light, making these polymers more suitable as “light harvesters” for solar cells and photodetectors. “The distance that energy can be moved in these materials comes as a big surprise and points to the role of unexpected quantum coherent transport processes,” said co-author Professor Sir Richard Friend from Cambridge's Cavendish Laboratory, and a Fellow of St John's College. The research team now plans to prepare structures thicker than those in the current study and greater than the optical absorption depth, with a view to building prototype solar cells based on this technology. They are also preparing other structures capable of using light to perform chemical reactions, such as the splitting of water into hydrogen and oxygen.